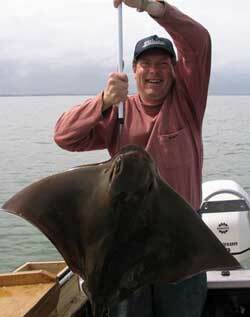 If you are looking for somewhere to fish that is bit different to the norm, try fishing the Kawakawa Bay area. I go through Clevedon, the way to Kawakawa Bay is clearly sign posted from there on. Be careful along this road as it is fairly windy. Once you've come into Kawakawa Bay, drive through the bay until you come to a shop on the right hand side. At this point there is a Y junction. Travel straight through this intersection and keep travelling on this road until it stops. Be careful travelling along this road as it becomes very narrow and windy towards the end. Once you have reached the end, there is a carpark directly to your left and behind you, on the left hand side, are some toilets. To fish this area, you will need a southerly wind, a fairly strong one is best as the turbulence and wind shadow created by a hill and trees directly behind you can be a bit of a nuisance launching the kite in lighter winds. The best tide here to fish is the incoming tide. The best baits are squid and mullet, preferrably squid. To fish this area safely and successfully you will need to be fairly competent in your kite handling skills. Only dropper rigs should be used here because to your left is a rocky point and outcrop of rock and reef offshore while to your right the rocky coastline continues. This bay is relatively narrow but the bottom is flat and sandy. It is like this for approximately 600-800 metres offshore. Above: Arron Buxton with one of the snapper he caught fishing at his big kite powered dropper rig at Orewa Beach last Friday. Arron reported that more than 10 other kite rigs were out on the day and most kite fishers caught plenty of good snapper with some fish over 18 pounds being landed later. Arron was using mullet for bait and caught six snapper for the day. It pays to be set up and ready to go approximately half an hour before the tide turns to come in. The moment it turns, the bay can be full of very large kingfish and they congregate for only 40-45 minutes. I have a large dropper rig which Rob at your kitefishing shop put two dropper sections on for me. On the first dropper section I run between 5-10 hooks and use the second dropper to run a floating bait or a popper. You will need to watch out for boaties in this area during the day as they can be arrogant and are targeting the same fish that you are. I usually fish here at night as there are no boats around and we always go out on a full moon and try to get a high tide around 9-9.30pm. There is a large reef system directly in front of you in this area approx 1000mtrs offshore, so becareful not to go out too far. There is also a very large tuatua bed 600-800mtrs offshore, this is what the snapper come to feed on. In this area you will also catch kingfish, kahawai, big trevally and very good 8-10 pound snapper consistently. Beware, during the summer months there can be a lot of baby hammerhead sharks and eagle rays which can become a nuisance. This bay is only suitable for one kite fisher at a time due to the narrowness of the bay. Generally, you will only have to put 3-4 sets out and you will have your catch limit, so don't be greedy, save some fish for tommorrow and let your fellow fishermen enjoy this area as well. I fish this area a lot and always clean my mess up, so if you go there lets not spoil it, simply enjoy it. Albert has been fishing a flexiwing kite rig from a stand up rod and reel setup around Hawaii for around six months. The locals are in awe with the whole system and how it all works. He sent the following report in recently. During the last trip fishing was going well until the kite crashed and got caught on some rocks on the bottom. I had to dive in to retrieve it as it was deep, I snagged it with another line and pulled it free, breaking off the drogue and drogue bridle in the process. One of the fish we caught is what we call a "Hawaiian salmon". Another name is "rainbow runner". I don't know what the scientific name is. I have included a photo, too bad there isn't anything to give a sense of the actual size. I think it was about 5 pounds. 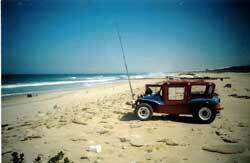 I thought I would send some pics of the area I kite fish from in South Africa, the beach is known as Hougham Park and is a privately owned beach. 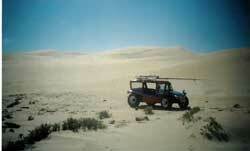 It is situated 30 minutes from Port Elizabeth, my home town and is accessible by 4X4 or by dune buggy. The buggy in the pics is mine. 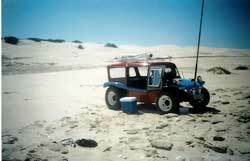 I use this buggy mainly for kite fishing purposes and use a 15 foot rod, a Penn Senator reel with 400metres of 43kg breaking stain line and 600 metres of 23 kgs breaking strain line. The rest of the rig is pretty much in line with your dropper line specs. The area I fish from is great white shark, rag toothed shark and blue ray breeding grounds and you have to use 250kg steel trace and a 12.0 hook to fish with. Normally, you loose the shark in the breakers or he bites off the steel trace. This area is also situated on a reef and makes kite fishing difficult. 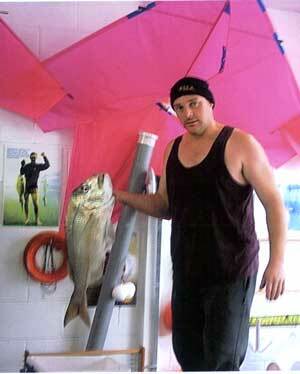 The bait set up is normally a 3 to 5 Kg cob, a South African salt water edible fish. I use a double buoy system which suspends the hook so that it does not foul on the reef. The first buoy is a 2 litre cooldrink bottle and the second buoy is the float from a toilet cistern float arm which works well. I hope to send you pics of one of the sharks that I have caught. Unfortunately, the fisherman's tale goes that I never seem to have a camera with me when we catch. Thanks for a great site and newsletter. Good luck in the rugby world cup. We both have a common enemy. Caught this stingray on a 2 hook target snapper hook rig on a light rod with 5kg line. Needless to say it took a while to land. We smoked a wing which was firm but had good flavour. ED : If anyone wants to catch sting rays fish with crab baits, the bigger the crabs the bigger the stingray you will catch. 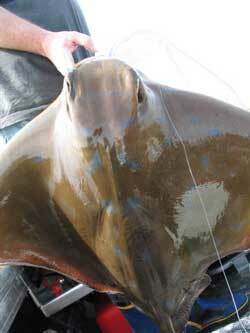 Big sting rays take whole fish as well! I have seen a ray of immense size trying to swallow a 3 pound snapper whole when doing sea trials of the Target Snapper Hooks aboard the commercial fishing vessel Oceana. Apologies for not keeping up with the monthly photo winners.